This item replaces old catalog #2930QR. Box Dimensions (LxWxH) 13.5 x 8.6 x 2.7"
143RC Magic Arm with 200PL-14 Quick Release is rated 4.0 out of 5 by 4. Rated 1 out of 5 by Anonymous from Buy the variable-friction one. I bought this because I used a variable-friction arm on a job a month ago and loved it. However, after a week of adjusting the arm once a day, the quick-release level is now broken. Unbelievably high price for such poor quality. The owner of the variable-friction arm I was using said he has used his daily for several year without issue. 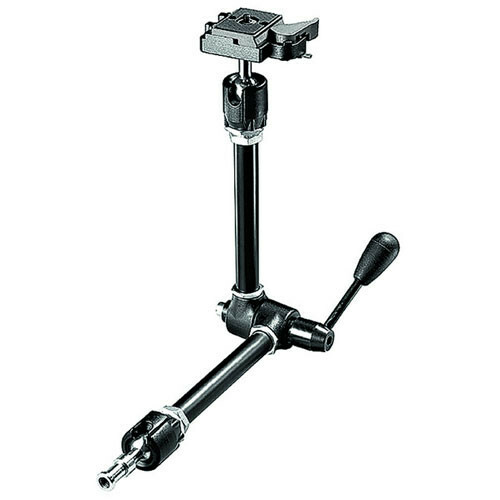 Rated 5 out of 5 by Bohan from Super solid and sturdy Typical quality for Manfrotto's good stuff. Strong and sturdy, I don't think twice about leaving a 1D on it. It would be handy if the handle was in-line with the arms when it's folded up, for easier storage. Rated 5 out of 5 by Brad from Great Tool I really like how versatile this magic arm is. Allows me to attach to just about anything with the Super Clamp and I can get some really cool shots. Highly recommend this if you shoot a variety of things.